How do you rate your stay - from 1 to 5 stars? What were your favorite things about the resort? The feel of romance everywhere!! All the employees made you feel special and made sure you had everything you wanted so you and your significant other could concentrate on each other and enjoy each other. Plus all the included activities. The no tipping policy was great. Once you are in the resort, you never have to carry money with you unless you do an excursion. If they are Couples employees there is no need to tip them. Everyone is treated equally!!! What were your least favorite things about the resort? Having a room on the first floor. They were at full capacity (even though you didn't feel that they were) so they couldn't move us. If they had had a room available, they would have accommodated our request. It was still a great room with a wonderful view. What are your best tips for future travelers to the hotel and/or destination? If you have a problem or a request, just tell them about it and they will find a solution and make it a wonderful stay for you. The food is awesome and you can eat somewhere on the resort 24 hours a day. Who would you recommend this all inclusive resort too? As the name says, Couples only!!! With an 87% approval rating Couples Tower Isle is an excellent option for a romantic getaway! As an added bonus, it is also slightly less expenses than the other Couples Resorts in Jamaica. Click on this link for more information about Couples Resort Jamaica. Join in and write your own page! It's easy to do. How? Simply click here to return to Couples Resort Jamaica Reviews. Our Couples Jamaica stay was 5+ stars! For your Couples Tower Isle Resort review, what were your favorite things about the resort? We liked is the fact that there were a variety of excursions included in the total cost of our stay at CTI. As that worked out to be a real bonus as well! What were your least favorite things about the All Inclusive Couples Resort? the one single thing we would've liked to have been different, but didn't it wasn't a big deal nor did it ruin our trip, was that we would have liked to have been able to go for a lengthy walk along the beach of the resort but this is not possible at this location. go, enjoy yourselves and spend time as a couple! it's worth every penny and you won't be disappointed. it's a couples resort, so it is not one to be recommended to families. We would certainly recommend it to everyone though and can't wait to go back! You can read more reviews of Tower Isle at TripAdvisor. You can find more adult only all inclusive vacations on our Most Romantic Travel Destinations page. 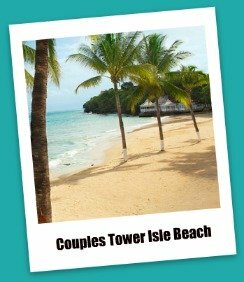 Couples Tower Isle is always a 5 star experience! What were your favorite things about this Jamaican All Inclusive resort? The staff... they are second to none, always make you feel at home,from the bell men greeting you upon arrival, to the houskeepers that take care of your room, to the waitstaff and bar staff,they are second to NONE! A watersports staff member discovers it's your anniversary, makes arrangements for champagne and a cake to be delivered to Tower Island, then seranades you.. what better staff than that. What were your least favorite things about the Ocho Rios Couples resort? Who would you recommend this Jamaican all inclusive resort too? I would recomend this resort to all couples in love. Family participation only if they are all ADULTS and traveling with a significant other. Thanks for your descriptive resort review! Check out TripAdvisor to read more reviews of Tower Isle. You might also want to check out our Best Romantic Travel Destinations page.